When I say most popular, the scale is what I’m talking about — be it region-wise (village / city / town, asia / europe / US, north/west/south/east) or age-wise (kids / teenagers / adults / older ppl) or relationship wise (friends / relatives / colleagues) — ever in history – dead or alive. A difficult question to answer — better would be to have a set of people rather than singling out one. I tried googling it as well, but perhaps wasn’t quite able to frame the right search query. 1) Michael Jackson — yeah the recent news storm actuated the thought, besides him being my first guess. Now the popularity could be not about know about the person — just having heard the name would suffice as a popularity parameter. There are many that I didn’t include in the list, simply because there’s no end to it and 10 seemed like a decent figure. Update: here is another post that talks about the same thing. This entry was posted in Uncategorized and tagged Popular person in the world on June 27, 2009 by admin. Sneak peek in a traffic jam — Gurgaon, India. 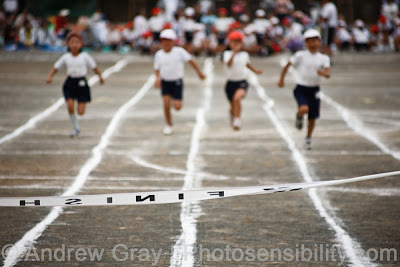 The race started, children ran with all their energies. Seeing this, the other participants — all seven of them, came back. One of the seven consoled her, kissed her and held her had to pick her up. All seven joined in and carried the girl to the finish line. The crowd, needless to say, was baffled. Few claps grew into thousands and the whole crowd was on their feet, many with tears in their eyes. This, readers, is a true story that happened in an event held in Hyderabad for mentally challenged children – National Institute of Mental Health. These children were all mentally challenged — we, the normal people would never do that – why? because we have brains. I read this story in our office notice board — and I personally was quite moved by it. How many times have we heard about something like this? This entry was posted in Uncategorized and tagged inspiring, race mentally challenged, teamwork on June 9, 2009 by admin.